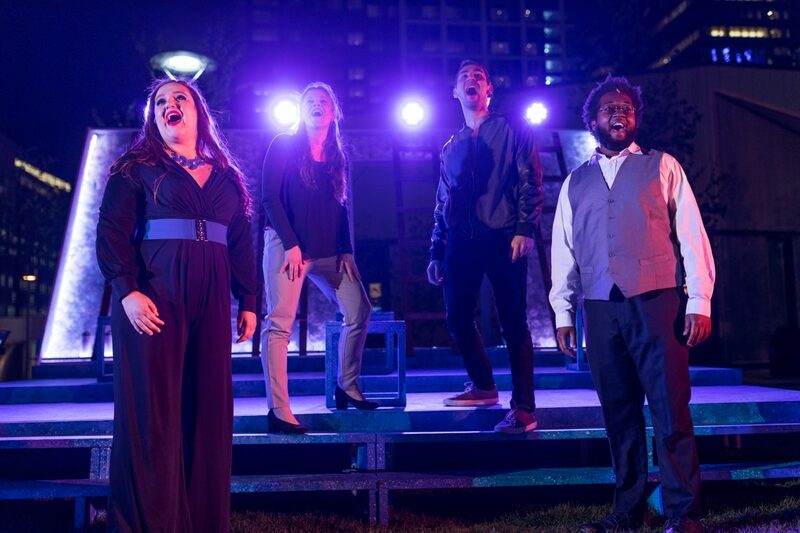 Songs for a New World, Jason Robert Brown’s breathtaking song cycle, weaves together the stories and voices of a diverse cast of characters in a musical journey that transcends time and space. A soaring, vibrant score transports the audience through a mesmerizing exploration of the unknown world and the tough choices that follow. 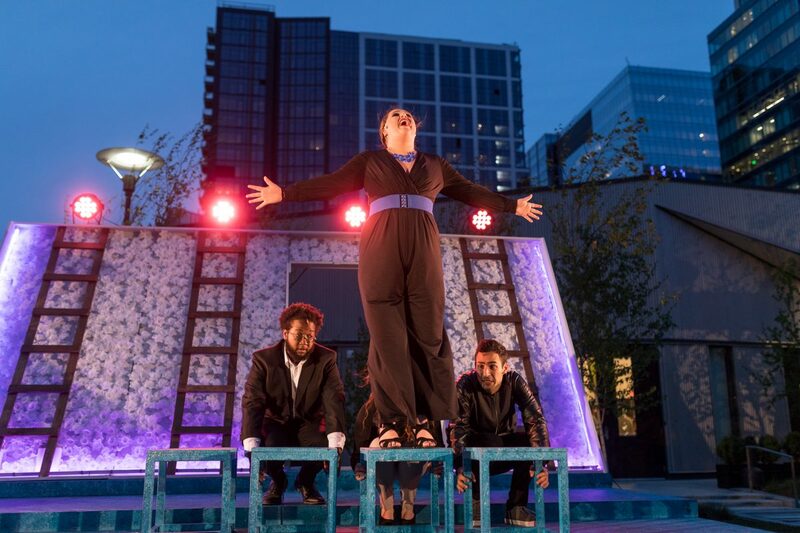 Bursting with life and discovery, Songs for a New World begs to be liberated from the walls of a theatre, and will be presented at over 10 outdoor venues throughout Massachusetts and Delmarva as Brown Box’s premier musical spectacular. Rob is thrilled to be a part of her first production with Brown Box Theatre Project. Select choreography credits include: World Goes’Round (Emerson Stage), Thoroughly Modern Millie, select showcases with Emerson Dance Company, and the summer 2015 season of The Palace Youth Theatre. Favorite performance credits include: Merrily We Roll Along, Guys and Dolls (Emerson Stage), Bold Girls (RareWorks Theatre Co.), Jesus Christ Superstar (Winnipesaukee Playhouse), Carousel, Les Miserables, Singing in the Rain, Best Little Whorehouse… (Mac-Haydn Theatre). This past summer, Rob worked as an actor for Chgph./Dir. Richard J. Hinds through RWS & Assoc. at Hershey Park. Rob has just graduated from Emerson College with a BFA in Musical Theatre. Joshuah is a singer and actor originally from Cheraw, SC. A 2016 graduate of Harvard College, Joshuah studied French and music and performs frequently as a vocal soloist and ensemble member. His undergrad credits include Dreamgirls (Harvard BlackC.A.S.T. 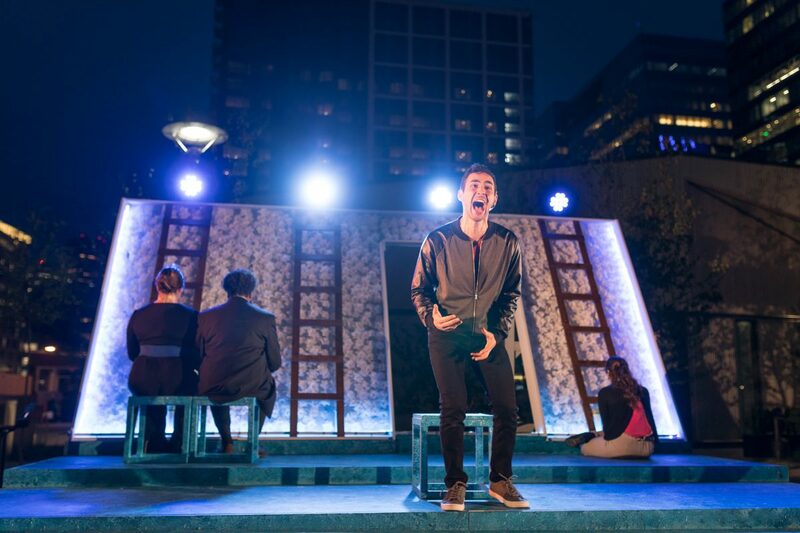 ), Endgame (Harvard-Radcliffe Dramatic Club), and two years in the cast of the Hasty Pudding Theatricals. Joshuah is also a great cook, an aspiring world traveler, and a believer that #blackartmatters. He just completed a guest artist residency with Boston’s The Theater Offensive. He makes his post-grad and Brown Box debut with Songs! Alejandra is thrilled to be joining Brown Box Theatre Project’s production of Songs for a New World. She was last seen as ‘Rose’ in Speakeasy Stage’s Production of Dogfight. Ale is a recent graduate of the Boston Conservatory, where she got her BFA in Musical Theatre. She would like to thank the cast and crew for this incredible experience. 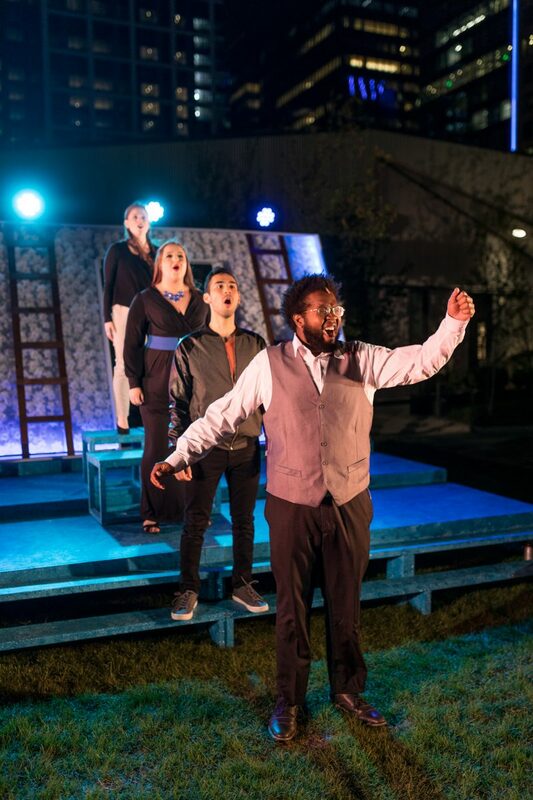 Felix is overjoyed to be working with Brown Box again after playing Posthumus in Cymbeline last summer. Boston Credits include Franklin (Boston Playwrights’ Theatre), The Winter’s Tale (Actors’ Shakespeare Project), Lobster Girl and Meet Me in St. Louis (Stoneham Theatre), In the Summer House (Fort Point Theatre Channel), Invasion! and ¡Bocon! 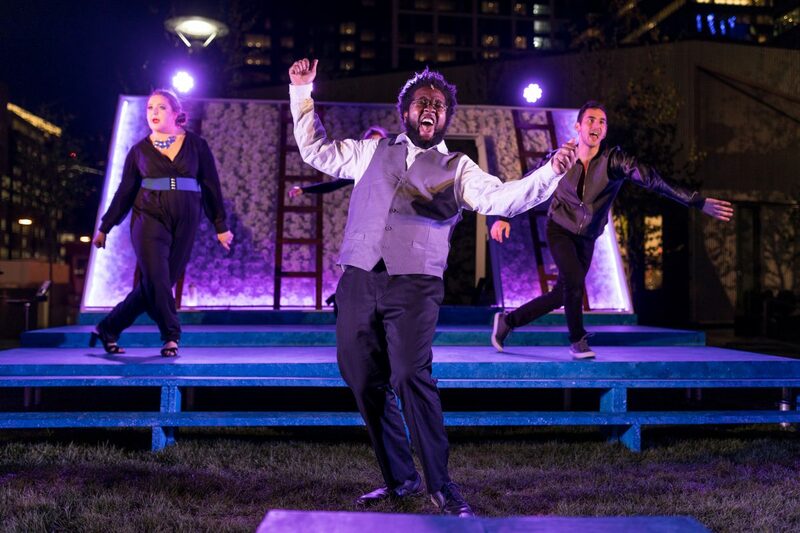 (Apollinaire Theatre Company) 27 Tips for Banishing the Blues and In the Wake of the Graybow Riots (Sleeping Weazel) and Two Gentlemen of Verona (Commonwealth Shakespeare Company). He graduated from Emerson College with a BFA in Acting in 2016. Love and gratitude for the constant support of Maya, Dad, Mom and Nana. Hear my song: It’ll help you believe in tomorrow. Weinberger for teaching her piano and a love for music. Boston Theatre Community Member of the Year by ArtsImpulse in 2016. HANNAH PRYFOGLE (Associate Producer) is a Boston transplant from the Bay Area of California. She is a proud alum of Emerson College, where she studied musical theatre and arts management. Hannah has worked in various positions at Lyric Stage Company of Boston, SpeakEasy Stage, and American Repertory Theater. 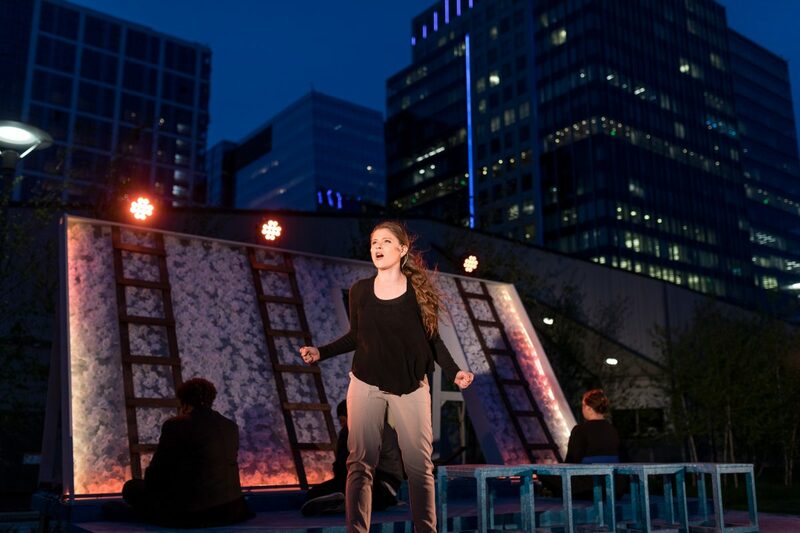 She is also the Patron Relations Coordinator at Fresh Ink Theatre Company and directs throughout the city. variety of theatres and independent projects. Sloth Levine (Asst. Stage Manager) is a recent graduate of Emerson College with a BA in Theatre Studies: Directing & Playwriting. Sloth has served as the Assistant Stage Manager for Cymbeline with Brown Box. Their directing credits include The Hobbit and James and the Giant Peach at the Boston Public Library in Copley Square, Marvelous Oz (Kidding Around), and Safety Exits (EmersonStage). Writing credits include Marvelous Oz with Bridget Driscoll and Murder at the Carlson’s with Madison Gerringer (RareWorks). Michael also has costume designed The Little Prince (Kidding Around) and Bold Girls (RareWorks). include Boxer Shorts II: From Water to Dust, Macbeth, and A Midsummer Nights Dream. Dave is an electric & upright bassist, drummer, and producer originally from Singapore. He’s the founder of Interrobang Records and a triple-graduate of Boston’s Berklee College of Music. Dave also attended The Bass Collective in New York City, where he appeared on Victor Wooten’s instructional DVD “Groove Workshop” (2008). Recent bass credits include the 50th anniversary of “Hair” at the LaMama Experimental Theatre, In the Heights, Spring Awakening, Legally Blonde, AIDA, The Wiz, Next to Normal, Avenue Q, Cabaret, Jesus Christ Superstar, The Rocky Horror Show, Bloody Bloody Andrew Jackson, Disney’s The Little Mermaid, The Last Five Years, and more. Brian is very excited to be apart of his first Brown Box production. He is a current student at Berklee College of music where he is studying drumset performance and contemporary writing/production. Brian has performed in numerous shows including Legally Blonde, Anything Goes, Thoroughly Modern Millie, and The Addams Family all throughout the northeast. He would like to thank all of his past and present teachers, family, and the entire cast and crew. Michael is a music director/musician originally from Westchester, New York, and Songs for A New World marks his 120th production. Credits as music director include Miss Saigon, Les Miserables, Into the Woods, Pippin & [title of show]. Michael has also written orchestrations for over a dozen productions, including Legally Blonde, Rent & The Wiz. Upcoming projects include Cabaret, All Shook Up, & The Hunchback of Notre Dame. Michael currently attends Berklee College of Music as a film scoring major.